Crouse-Hinds Ark-Gard® Dead end two gang interlocked circuit breaking receptacle has die-cast copper-free aluminum construction with aluminum acrylic paint finish. 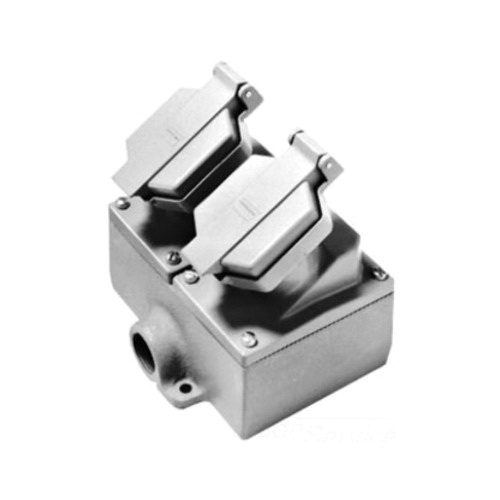 Its molded-in contact design provides superior interior contact reliability. This receptacle operates at a voltage rating of 125-Volts and current rating of 20-Amps. It is perfect for damp and corrosive areas. It is suitable for portable electrical equipment such as compressors, tools, lighting systems and similar devices. The interlocked circuit breaking receptacle meets ANSI/UL Standard 1010, NEC® Class I, Division 1 and 2, Groups B, C, D Class II, Division 1 and 2, Groups F, G Class III, CEC Class I, Division 1 and 2, Groups B, C, D Class II, Division 1 and 2, Group G Class III, NEMA/EEMAC 3, 7BCD and 9FG standards.